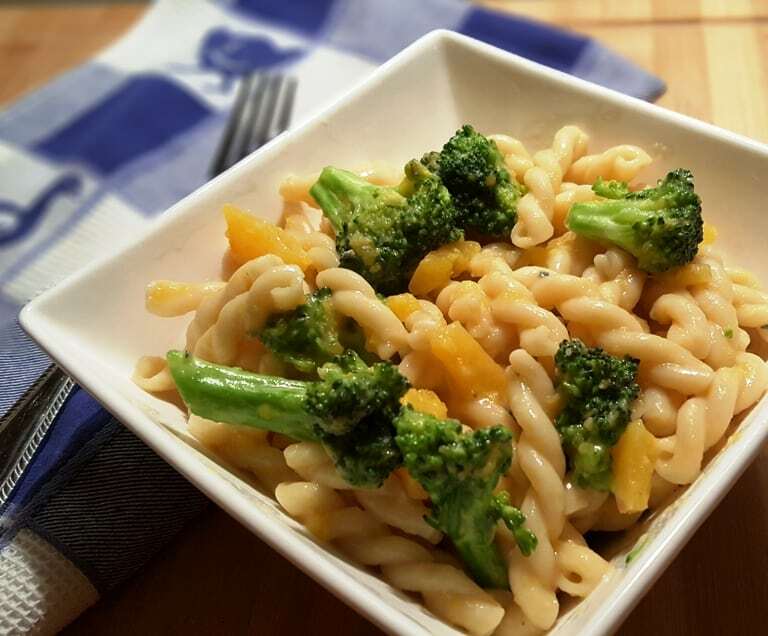 Pressure Cooker Blue Cheese Broccoli Butternut Pasta is a sweet and savory one pot meal, which is ready in under 15 minutes. Completely and utterly surprised at just how delicious my Pressure Cooker Butternut Squash Pasta tasted, I set out to make another dish using my Pressure Cooker and butternut squash. 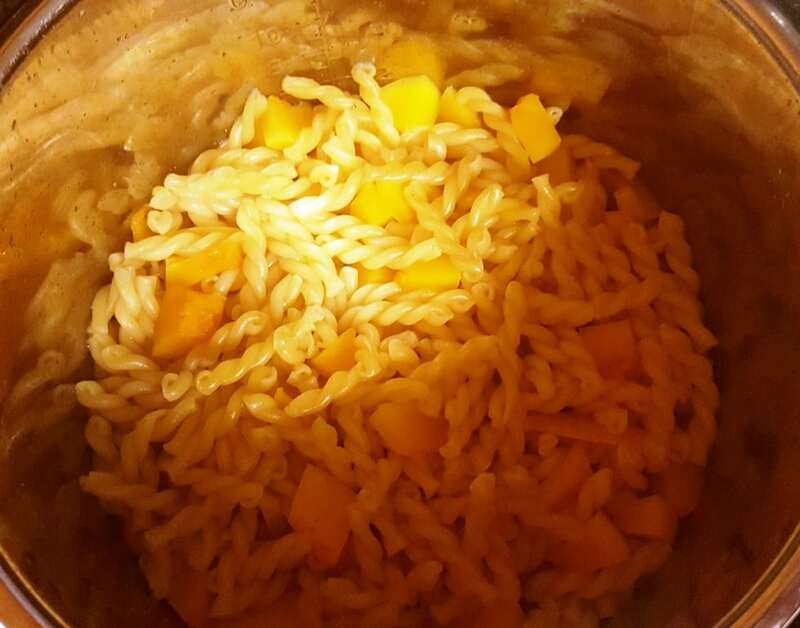 My husband ‘thinks’ that he does not like butternut squash. He only seems to not like the squash when he can see it. He loves broccoli and he loves pasta, so I thought I would try another pasta dish with butternut squash and a buttery Parmesan sauce. The butternut squash partially melts into the pasta and makes a nice sauce all on its own. With some ingredients, top name brand is not always important. For pasta dishes, however, I really believe that a good brand is a key to a good pasta dish. I used my Pressure Cooker Bone Broth (Stock). A store-bought stock is fine, bouillon is fine. Vegetarians, use vegetable broth or water. I pretty much only use De Cecco Brand. I love the cute little shapes. Amazon has the best price for the De Cecco. 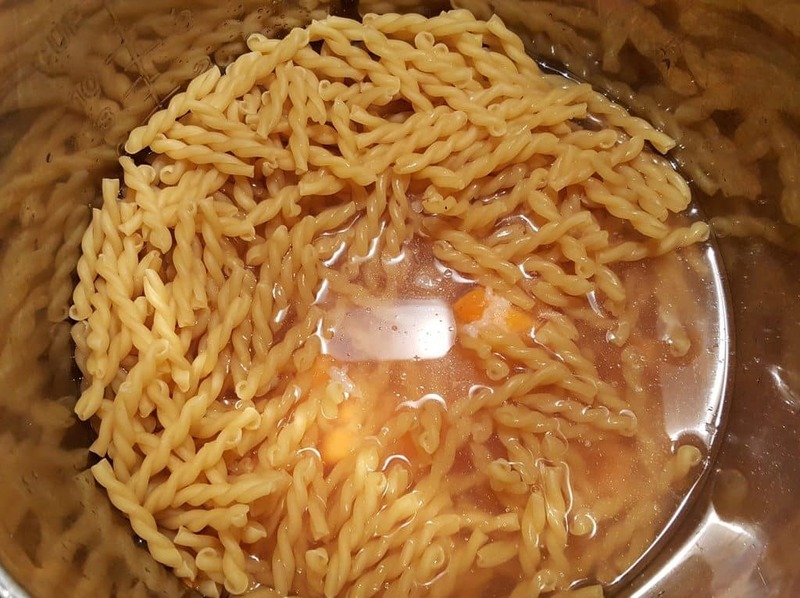 For this recipe, I chose the De Cecco Gemelli Pasta. Heat your Pressure Cooker until it is hot and then add a Tablespoon of Ghee. Add the butternut squash and let it brown a minute or two. I did not sauté as long as I usually do and that was a big mistake! Not for you guys, but for me…..my husband detected the squash in his bowl and refused to even take a taste! I love the bites of the Butternut Squash and the salty taste of the Blue Cheese. After the pressure has been released open the lid. You will see some liquid in the Pressure Cooker cooking pot, and that is fine. 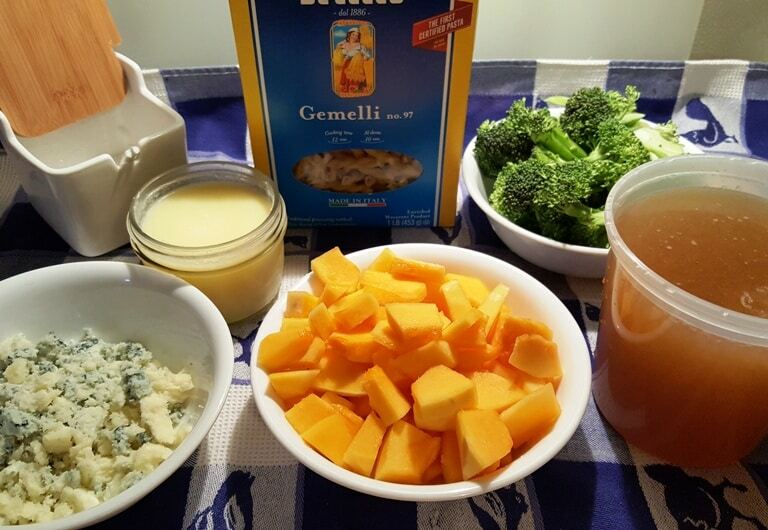 The Gemelli Pasta will continue to absorb the liquid and is just the right amount of the broccoli to steam. 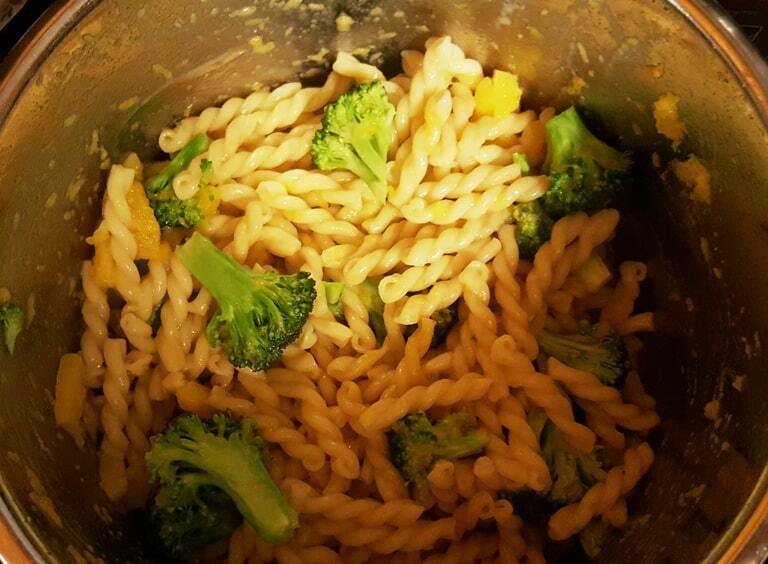 Pressure Cooker Blue Cheese Broccoli Butternut Pasta, all in one pot. It couldn’t be easier. Hit the Sauté or Browning button on your Pressure Cooker and add in the cut-up broccoli. Mix it through the pasta and let it steam until it is just about the tenderness you like. It will cook quickly, so keep checking to see if it is the tenderness you prefer. Up above, I said buttery and Parmesan. That was my intention. Buttery, Parmesan, Gemelli Pasta with Broccoli. Well, I had a hunk of Blue Cheese left in my refrigerator and needed to use it up. Since the butternut squash was very obvious in this recipe and knew my husband wouldn’t touch it with a 10-foot pole, I might as well do what I like and serve him a bowl of cereal. 🙂 Yeah, I am serious. Blue Cheese is one of my favorite things, ever. Growing up, the only dressing that I put on my salad was Blue Cheese. This is another ingredient my husband does not like. Interestingly enough, I make a big Cobb Salad every year to bring to the Hollywood Bowl for one of our Summer Events. He always loves the salad. Hmm, go figure. I do serve it to him already mixed together. Add in the Blue Cheese and stir into the Gemelli Pasta. 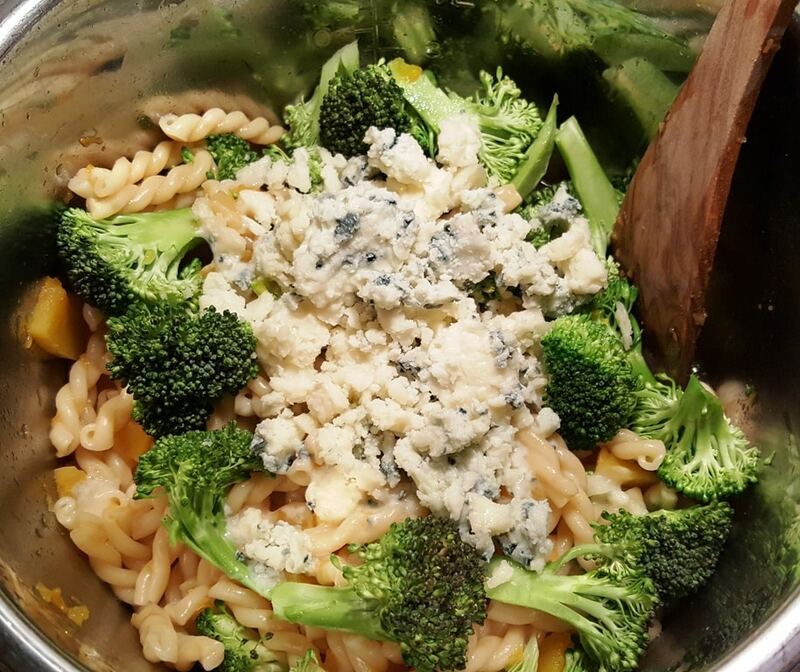 The broccoli will finish cooking and the Blue Cheese will melt into the pasta. 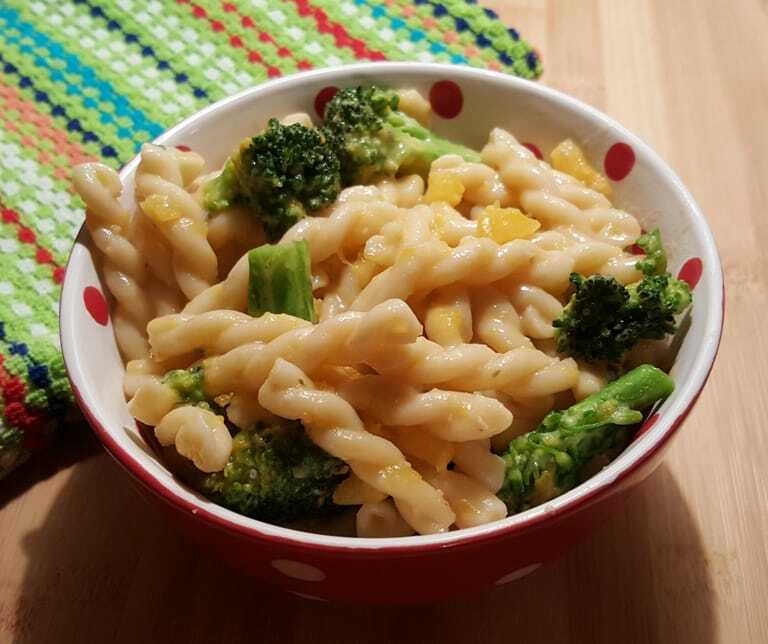 This Pressure Cooker Blue Cheese Broccoli Butternut Pasta is rather unusual, but, oh, so good! My Crispy Bacon Garlic Breadcrumb Topping would be fab on top of this; almost like a Cobb Pasta! Add the Ghee and Butternut Squash and cook for one minute and then hit Cancel. Add pasta, garlic, salt and Stock to your Pressure Cooker cooking pot. Select Sauté or Browning button on your Pressure Cooker. Add broccoli and stir in, pushing the pieces underneath the pasta. The broccoli will cook quickly, so keep checking until you reach your desired texture. Add Blue Cheese and mix through. Rule of thumb for pasta. Look at the package cooking directions. Choose the lower number of minutes and then subtract one minute. You can use any pasta you like. 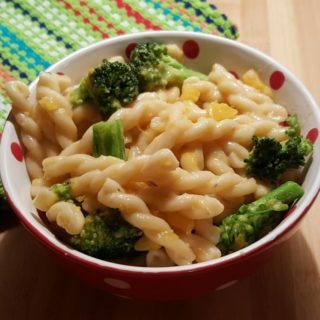 PIN this Pressure Cooker Blue Cheese Broccoli Butternut Pasta! Thank you for visiting my blog. It is nice to hear that you enjoyed this recipe! Just a quick question, instead of the blue cheese I could use parmesan right? My boyfriend loves blue chesse so I’m definitely making this one but I would also like to try it with paremsan. How would you change this for frozen broccoli? I would love to throw it in with the pasta, but would that change the pressure cook time or the amount of liquid? Thanks!